After decades of isolation, followed by five years of reform-driven growth since 2011, Myanmar’s economy is currently expanding at a record rate. The current period of economic expansion results from two main forces: a raft of new government liberalisation policies, which have made it easier to do business in the country; and the fact that Myanmar started from a low development base which has meant wide scope for growth as the economy is playing catch-up. Political reforms have brought about economic benefits, as is evident from the recent easing of the US sanctions in 2016 that had weighed on investor sentiment and trade growth. Myanmar’s growth hinges on public expenditure. Private consumption has been steady over the years and is expected to continue growing in the coming years, driven by private sector-led construction activity as well as rapidly expanding domestic and foreign investment in the services, industrial and agriculture sectors. Overall, economic prospects are favourable on the back of rising tourism, rising investment1 and construction, as well as growing gas exports. An easing of growth since 2014 continued into 2016. Economic activity slowed to 6.4% in 2016, weighed down by subdued demand from trade partners, slow recovery from floods in 2015 and uncertainty about the direction of economic policy under the new elected government in November 2015. Industrial output, including food processing, construction activity, and gas production all decelerated. Public investments remain constrained by a narrowing fiscal space due in part to external shocks (weaker than expected commodity prices) as well as increased losses from state enterprises. Private investments remained muted, with business adopting a “wait and watch” approach owing to limited visibility on the economic policies of the new administration. Fiscal deficit was 4.6% of GDP in 2016. The government has pared back spending, while trying to maintain support to priority areas such as education and health. 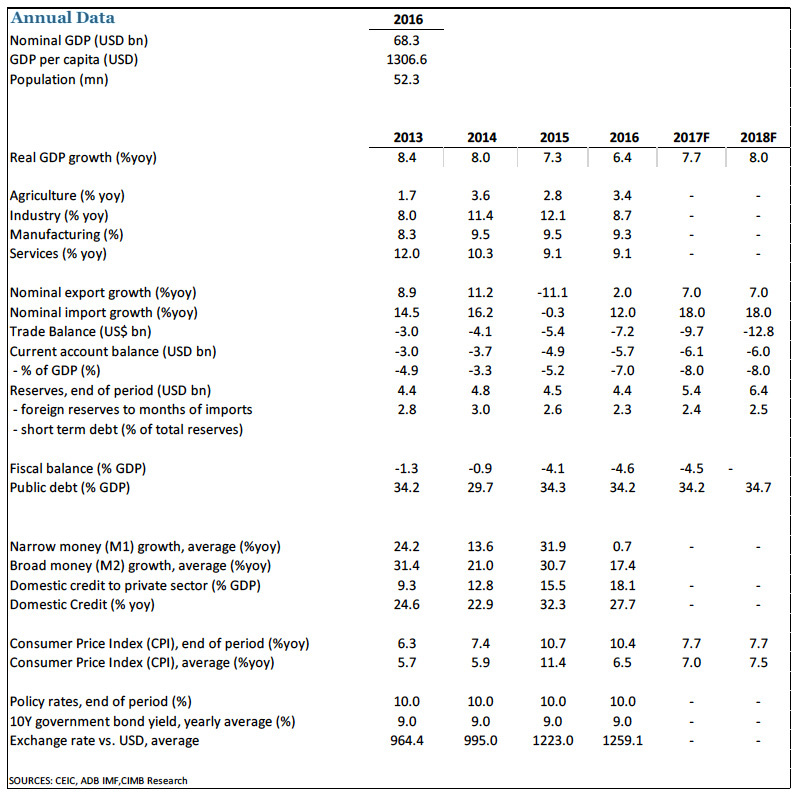 There has been an improvement in public debt-GDP metrics. Public debt remains at an acceptable level (34.2% of GDP), falling from more than 200% in 2001, primarily due to write-off by creditors and Japanese support on clearing arrears to the World Bank. A recent joint IMF/World Bank debt sustainability analysis concluded Myanmar at low risk of debt distress. Going forward, the economy is expected to grow at 7.7% in 2017. Private and public investments in infrastructure services (power, transportation) and non-commodity sectors (light manufacturing, hospitality) are expected to show an uptick, subject to continued macroeconomic stability, and progress on structural reforms. Easing of sanctions by the US and supportive pro-growth policy agenda2 from the new government provide a favourable environment for investment. The ending of economic sanctions has triggered an investment boom amid an abundance of low-cost labor, Myanmar’s nascent manufacturing industries look set for higher growth3. Myanmar suffers from high structural inflation and is exposed to fluctuations in prices of local agricultural produce. Having peaked at 11% in 2015, inflation saw a decline in 2016, though largely due high base of comparison. Expect inflation to remain elevated at 7% given a combination of a fast growing money supply, recent hikes in electricity and commodity prices, spiralling property prices and volatile agricultural production (mainly rice supply). Exports are expected to stage a recovery, benefiting from the recent revival in commodity prices and a gradual pickup in demand for major trade partners. Imports have been increasing steadily in recent years and are expected to move in tandem as economic reforms take hold and international ties strengthen. Imports of capital goods are likely to see a rise in the short term given the large scale investments. The current-account deficit largely reflects a rising trade deficit (falling revenue from natural gas exports with rising imports). The deficit is expected to remain high in 2017 amid surging imports. The situation, therefore, underlines the need for investment in export industries. The Central Bank is faced with challenges of high inflation, rising credit growth, and pressures on the currency in the wake of tighter monetary policy in the US. Further, policy buffers remain poor with weak FX reserves (less than three months of imports, well below IMF stipulation of 5-6 months of prospective imports). Exchange-rate pressures could return in the short term stemming from a sizeable current account deficit, thereby stoking inflation. As highlighted by the World Bank, establishing a well-functioning exchange rate system is therefore critical in enabling Myanmar to benefit from growing trade and investment opportunities. Financial deepening from a low base will continue to boost credit growth. Credit growth has outpaced nominal GDP growth, which potentially presents a risk. Policy rates are unchanged at 10% and no near term changes are expected. However, a tighter monetary policy stance is likely over the medium term to reduce inflationary and depreciation pressures on the exchange rate. Despite political progress towards democracy and civil society, internal tensions hamper the outlook. In addition, the business environment remains weak. The country still ranks poorly (170 out of 190) in the World Bank Doing Business survey 2017, with significant shortcomings on contracts enforcement and investment protection. Though Myanmar is a low-cost producer, but costs of doing business remain substantially high, owing to the dilapidated state of infrastructure. 1 Garment manufacturing is growing rapidly and offers opportunities, along with food, retail, telecoms, hotels and hospitality. Also, large projects in areas of oil and gas continues apace. 2 In 2016, the NLD government released its first economic policy, with a focus on providing support to agriculture, industry and infrastructure development as well as highlighting the need to boost foreign investment. In addition, the Foreign Investment Law of 2012 was amended in 2016 making it more investor friendly. Disclaimer: All rights reserved. No part of this report may be reprinted or reproduced or utilised in any form or by any electronic, mechanical or other means, now known or hereafter invented, including photocopying or recording, or in any information storage or retrieval system without proper acknowledgement of CIMB ASEAN Research Institute. The views, responsibility for facts and opinions in this publication rests exclusively with the authors and their interpretations do not necessarily reflect the views of CIMB ASEAN Research Institute.